Here is a scan of a block of 10 of #64. It has the CTO2 cancel and a vertical line that was made during printing. Has anyone else seen one like this ? Does anyone have any more items to add on the "Mustard" colors ? The dot varieties of the mustard shade are also worth mentioning. 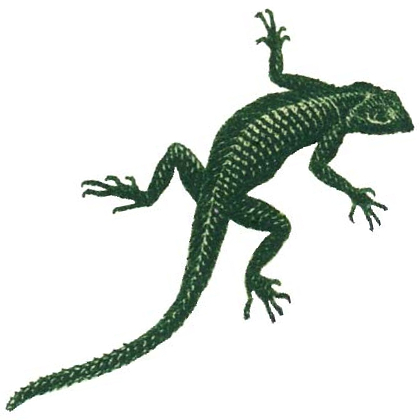 They can occur at various positions on the sheets and are semi-constant, i.e. 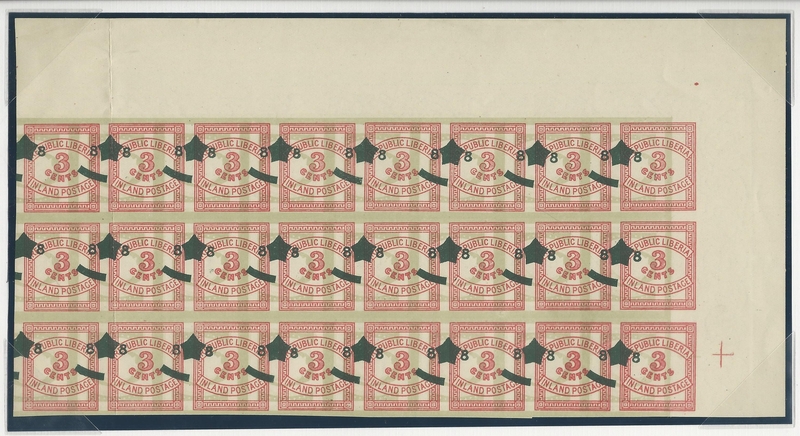 some of them can be found on more than one sheet at the same position, but not on all sheets. I assume these dots were caused by "perforation confetti" that got stuck to the plate for a few printing runs and then fell off again. The dots are most striking when they appear in the "3". I remember once seeing another sheet with the same flaws, but it had additional flaws elsewhere. My sheet also has a misaligned perforation between the third and the fourth row. Thanks Manfred for showing these. I will look over my stamps and see if I have any others like yours. I guess it's down to you and me to add items to the forum ? Here are more photos to add. 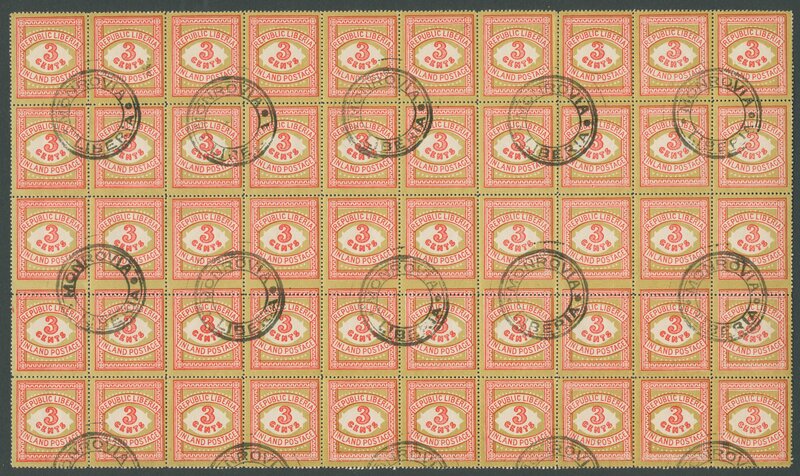 The 1st one is a inverted overprint, 13 dots at the bottom The 2nd one are 2 blocks of 4 with shifted red colors, two distinct colors. On the block of 4 on the right you will find that the bottom left stamp has one of those 'dots' on the '3'. Anybody have any more to add ? Lets keep it going ? I guess no more to add ? Does it stop here ? 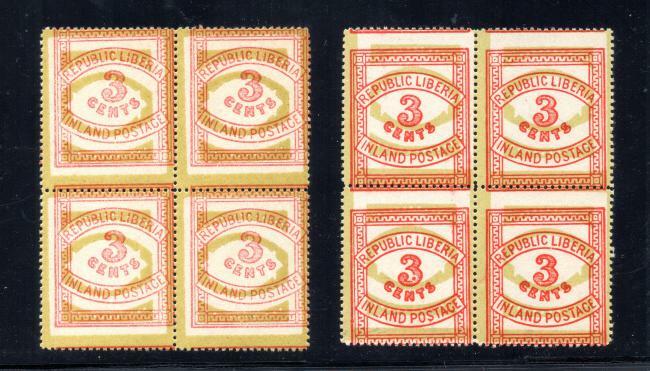 Here is my interesting mustard item... imperforate vertical. Regarding the 8c overprint, here is a 5c Essay. 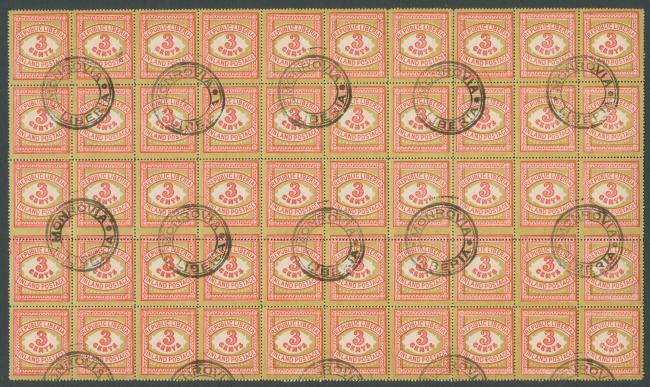 As Manfred mentioned earlier, the biggest puzzle is why 8c stamps were needed. I suspected that it is for some sort of parcel rate in multiples of 8c. 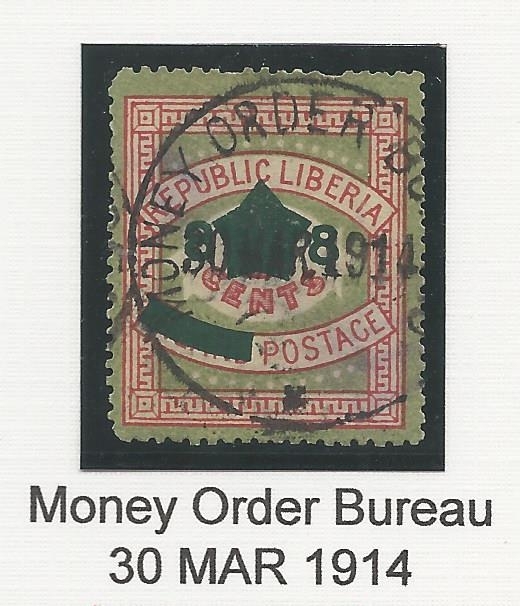 But, here is a Money Order Bureau cancel, 30 March 1914, likely used within the first year of issuance (or close to a year). So maybe 8c was the money order rate in 1913-14. Finally, regarding Die 2 (10 Pearls), here is a partial sheet that was likely used for alignment trials... Everything is shifted, and the reverse has red frames only. Not necessarily "waste", but I consider it a "practice sheet". 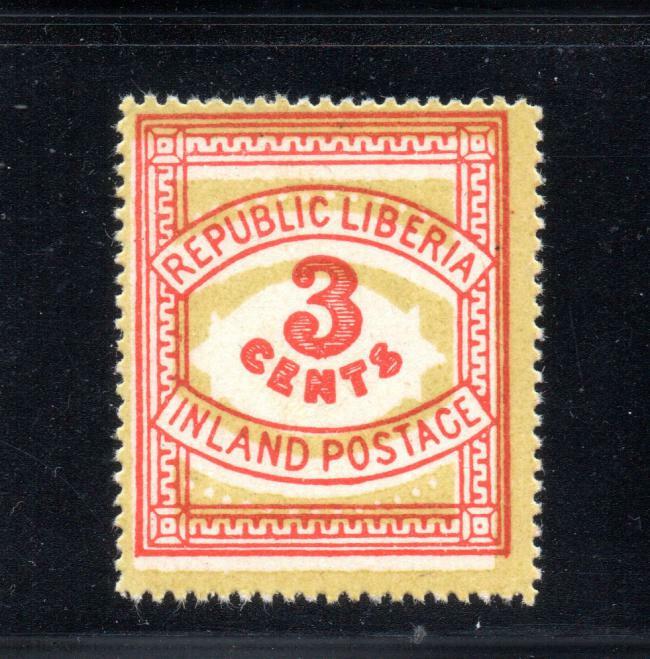 LIBERIA. 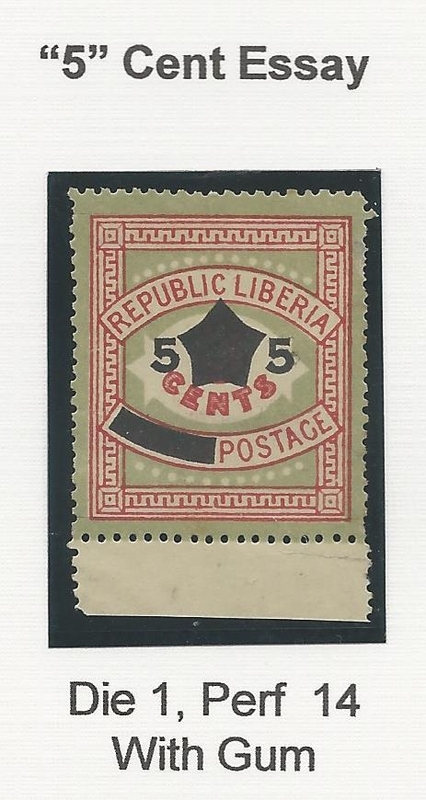 — Mr. H. L. Hayman sends us the 3 c. stamp of 1897, Gibbons' Type 33, with the value obliterated with a solid five-pointed star, and with figure "8" each side. 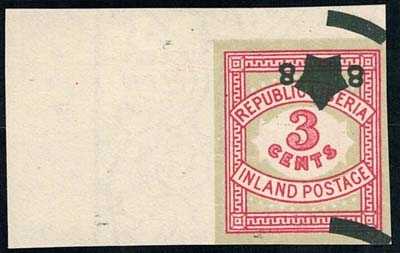 "INLAND" is also ruled out, but "POSTAGE" remains. It is required, we are told, for 1 oz. postage. The normal rate in 1913 was 5c per half ounce. 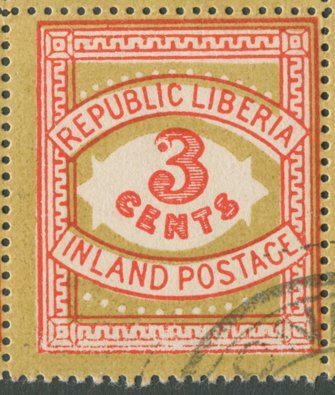 So, apparently shortly before WW2 Liberia introduced a reduced rate for heavier mail (for a few years anyway). 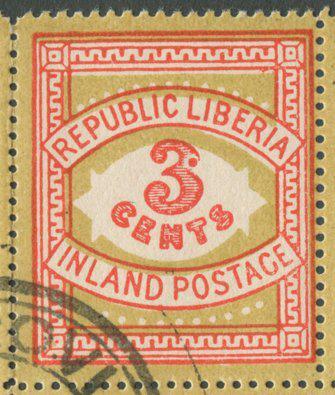 There is no information at all regarding this stamp except an entry in the Engraving Book dated 8/12/13: 'Engraving Star and 8 cents for Liberia postage stamps', and a further entry on 7/7/14: 'Engraving patch for Liberia stamp (Litho) 8 cents'.